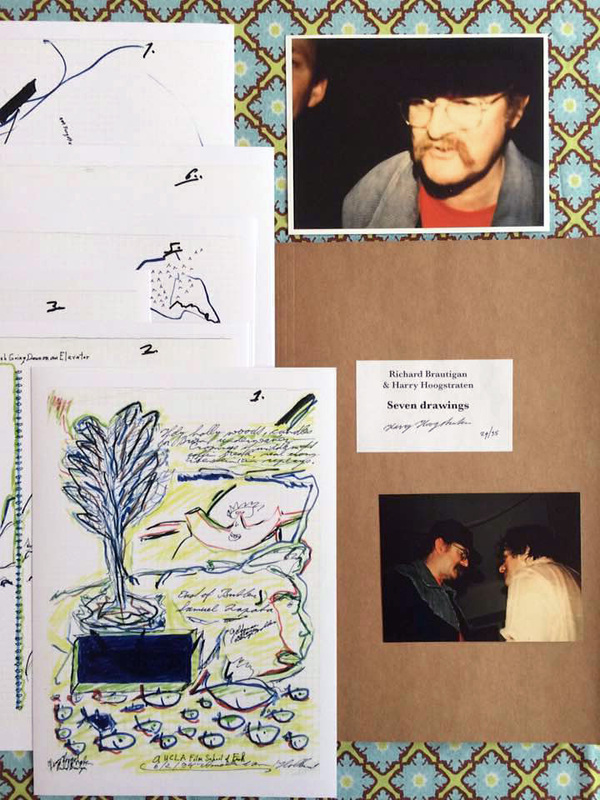 A year before he put a .44 Magnum to his head, American author and poet Richard Brautigan visited Amsterdam at the invitation of the One World Poetry festival, of which Dutch poet Harry Hoogstraten was an organiser. Brautigan (1935-1984) was already in a bad shape when he delivered a very brief performance at the festival and antagonised his audience. His alcohol addiction and years of depression were beginning to take their toll. Brautigan soon left for Mallorca but returned to Amsterdam a couple of months later, where he stayed in a hotel through January and February 1984, his wheels of creativity stuck in the mud of depression and addiction. 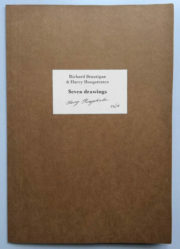 Brautigan’s mood only improved when Harry Hoogstraten looked him up and joined him in his drinking bouts. Together they explored the city of Amsterdam on foot, drank mescal and visited bookstores and markets. 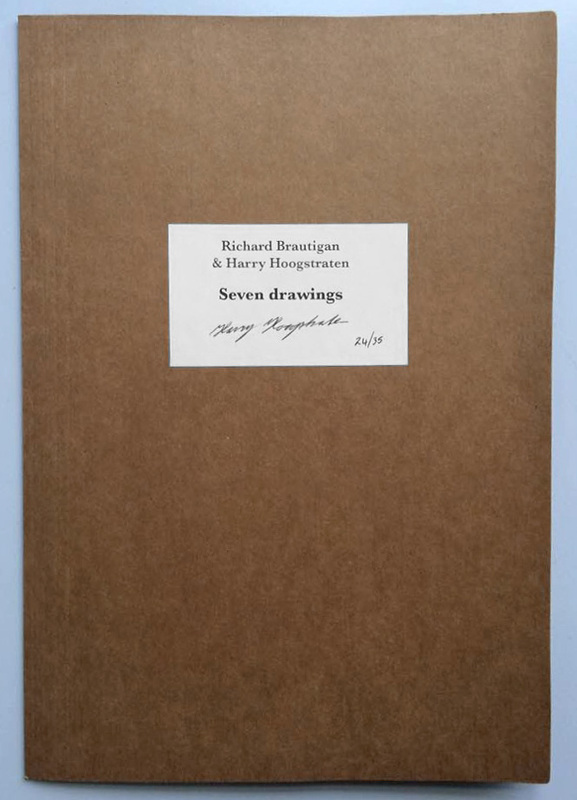 Hoogstraten even managed to shake Brautigan from his creative death and together they produced seven improvised drawings, which Hoogstraten kept in his archives after Brautigan left for Japan and put an end to his life later that year. 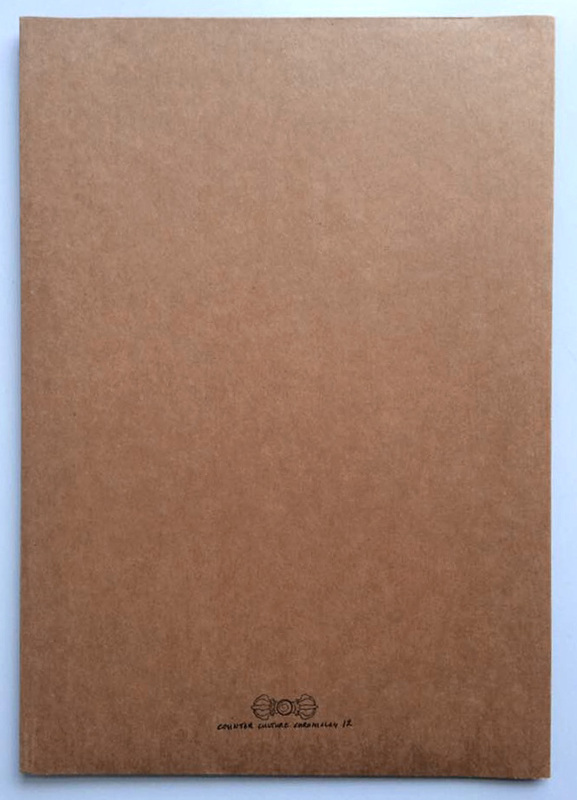 René van der Voort’s Counter Culture Chronicles has now dug up the seven drawings from Hoogstraaten’s archive and published them as a limited edition of 35 copies. 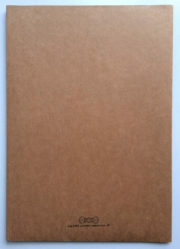 This unique edition consists of a brown folder, signed and numbered by Harry Hoogstraten, with the seven Brautigan/Hoogstraten drawings laser printed on white paper, two 1983 colour photographs of Brautigan by Harry Hoogstraten, and an accompanying text by René van der Voort.